"My sincere condolences. Prayers and thoughts are with you..."
"Diann and family, Our thoughts and prayers are with you..."
Donald Eugene Uhde, 87, of Mt. Vernon, IN passed away April 2, 2019 at his home. He was born February 25, 1932 in Posey County, IN to the late Rudolph "Doc" and Willamena "Minnie" (Rueger) Uhde. Don was a 1950 graduate of Mt. Vernon High School. He was a lifelong farmer retiring in 1995, but continued to help. Don enjoyed farming and working with his bulldozer. He had taught maintenance through the Posey County 4-H program. Don was an Army veteran and took part in Honor Flight EVV9 last November. 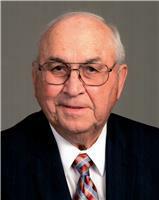 He was a lifetime active member of Trinity United Church of Christ and an involved leader with Indiana Farm Bureau. Don had served on the Posey County Soil and Water Conservation and ASCS Boards. He was preceded in death by his wife of 53 years, Eleanor (Leathers) Uhde; sister, Marilyn Statz; and brother, Robert Uhde. He is survived by his sons, David (Diann) Uhde and Darrel (Lisa) Uhde; grandchildren, Rebecca (Zach) Bender, Josh (Kristi) Uhde, Justin (Brooke) Uhde, Phillip Salomon and Amanda (Troy) Rexing; great-grandchildren, Connor Uhde and Ivan Rexing; and nieces and nephews. Funeral service will be held at 10:00 am on Friday, April 5, 2019 at Trinity United Church of Christ, 505 Mulberry St., Mt. Vernon, IN, with Rev. Jamie Kent officiating and burial to follow in Bellefontaine Cemetery. Visitation will be held from 4:00 pm until 8:00 pm on Thursday, April 4, 2019 at Schneider Funeral Home, 512 Main St., Mt. Vernon, IN and from 9:00 am until 10:00 am service time on Friday at the church. The family would like to thank Dr. Matthew Lee and staff for their care and concern. In lieu of flowers, memorial contributions may be made to the or Trinity United Church of Christ.